In another case of bizarre patents that may never actually come to fruition, Sony has copyrighted an idea for a RC car that would be controlled by the PSP. This might make me sound like an old fogey, but do kids still play with RC cars? Back in the day I had a few Radio Shack bargain bin models that I got as throwaway Christmas presents, but I figured that kids nowadays have their Club Penguin and Hannah Montana to keep them entertained. Guess I'm wrong or Sony hasn't gotten the memo, because the company's Europe branch has filed a patent for a RC car controlled by the PSP. It's definitely a far cry from the toys of my childhood. 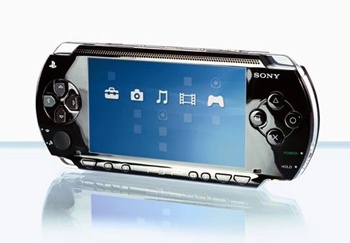 Sony's idea is for a car with a camera attached on top that transmits real-time footage to your PSP. From there, you watch the screen and steer your car accordingly. The video can then be recorded and stored on your PSP, making the toy a great tool, as Sony thinks, for kids "to spy on their friends... then upload the stored video images to a website." I can think of some less innocent uses for this thing, which would basically be like those mobile spy cameras you always see in movies. The other cool thing the device could potentially do is generate sort of virtual race tracks out of real world environments - you'd program a "course" by setting virtual markers and paths in real life. So, you can set a path around your dog, and if the car detects that you're not within that path, it'll freeze up and not let you drive. At the same time, you can also have the camera display CG images in place of the real-world footage. These kids don't know how good they have it. Back in my day, you played with Hot Wheels cars, and you only got those from Happy Meals at McDonald's, and you had to walk eight miles to the nearest one, and you could only pay for your food with nickels, which had bumblebees on them at the time - gimme five bees for a quarter, you'd say. This idea is too awesome to be left in the hands of Sony. Well, I gotta say that does sound pretty cool, I mean I would give it a shot if it turned out good. I could just imagine controlling an RC car outside with a PSP, giggling like a school chum and feeling insecure as to how stupid I look. I really do miss those RC cars at times but there were so many flaws on the later models. Such low battery life(10 minutes if I was lucky) and people in the neighborhood ever wanted kids to play with them outside at parks or school. Good fun when I got to play with an RC car. Ahh, you avatar chaged to old man Kururin. Sony thinks, for kids "to spy on their friends... then upload the stored video images to a website." Really I don't think that's innocent in itself but whatever. I don't see why it's really any better for it to be controled by the PSP as compaired to a regular remote control but thats just me. Re you sure it was eight miles? I distinctly remember having to walk eleven and seven ninths miles to get to McDonald's. Sony patents PSP controlled fireplace. This might work depending on the distance you can be from the car. A PSP controlled Aibo would be cooler. I guess I was luckier than you, then. I had a Tyco race track, where you'd push a button and your car would drive around the track. And the track was fully customizable, only limited by your imagination! I'd have loops, jumps and turns, all within a meter. I also seem to have forgotten the weather, too. Most people remember snow, but I had to walk through a vacum, so there was never any percititation and you had to hold your breath the whole time. A better idea would be radio controlled tanks with IR emitting guns and a camera on the turret, plus IR receivers on the front, side and back which registered hits on the armour. The PSP could have a CG HUD overlaid on the camera vision, with GFX and SFX which enhanced the battle. Also you could have a basic RC tank model, but actually choose different tanks on the PSP, which have different stats like speed (the RC model's speed could be limited by the PSP), cannon power and armour levels (like some tanks could have lots of front armour, but weak armour at the back, whilst another could have medium armour all round). I think stalking a friend's tank around your back garden or in your house would be more fun than racing cars.